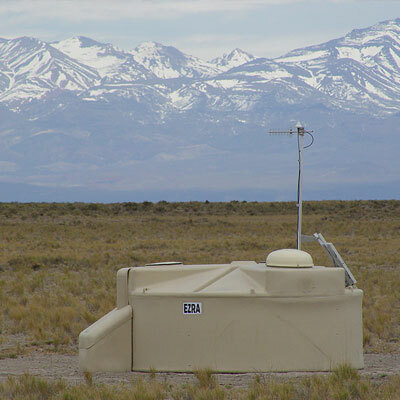 The Pierre Auger Observatory is an international cosmic ray observatory in Mendoza Province, Argentina that is designed to detect ultra-high-energy cosmic rays. Interest in studying these rays comes from the fact that the particles within them contain an extraordinary amount of energy—above 1019eV, or over a million times more powerful than the most energetic particles in any human-made accelerator. But these high-energy particles are extremely rare, hitting an area the size of a football field only once every 10,000 years. As a result, the observatory has created a detection area of 3,000 km2 (1,200 sq mi)—the size of Rhode Island, or Luxembourg—in order to record a large number of these events. Today, more than 500 physicists from nearly 100 institutions around the world are collaborating to maintain and upgrade the observatory site, and collect and analyze data. The 15 participating countries shared the $50 million construction budget, each providing a small portion of the total cost. A research project proposed in 1992 by nuclear physicists Jim Cronin and Alan Watson to study cosmic rays led to the development of the observatory, named after famed French physicist Pierre Victor Auger. Construction began in 2000, and the observatory began taking production-grade data in 2005. The observatory was officially completed in 2008. To learn more, visit the Pierre Auger Observatory website.